Osteoporosis prevented with which among the following? Teriparatide or parathyroid hormone (PTH) 1-34 is approved for the treatment of osteoporosis in postmenopausal women, men with osteoporosis, and patients with glucocorticoid-induced bone loss, especially those at high risk for fracture. PTH produces anabolic effects on the skeleton (ie, stimulates bone formation) when it is administered intermittently in low doses, while the chronic elevations of PTH, characteristic of primary hyperparathyroidism, are “catabolic” to bone, cause excessive resorption, and eventually increase fracture risk. Thus, PTH as a therapy for osteoporosis targets the narrow window between the anabolic and catabolic effects of PTH. Chapter 58. 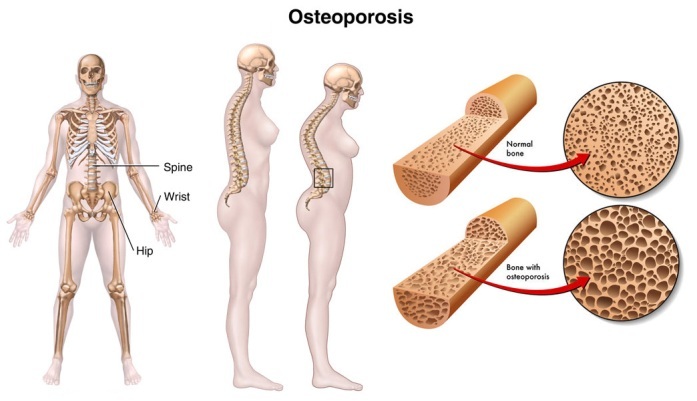 Osteoporosis & Glucocorticoid-Induced Osteoporosis. In: Imboden JB, Hellmann DB, Stone JH. eds. CURRENT Rheumatology Diagnosis & Treatment, 3e.